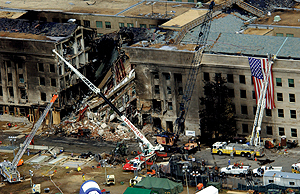 Within an hour of the Pentagon plane crash, Kilsheimers phone rang for requests from both Washington and New York asking him to aid in the disaster. Within two hours, he was enroute to our nations defense headquarters. A structural engineering specialist, Kilsheimer, BS 63, has become regarded as the go-to guy to call to rescue buildingsand many times, people trapped in buildingsin distress. Within minutes of arriving, Kilsheimer was on scene advising the FBI and Secret Service as to where they could and could not safely go inside the battered building. His work extended into helping other agencies research the crime scene. He and his crew would steer personnel away from potentially dangerous areas. If defense personnel needed something inside the building, Kilsheimer preferred to handle the matter himself. 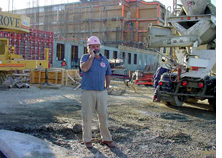 After moving up through the ranks of the business by paying his dues in field work, he started his own company, KCE Structural Engineers, in 1969. When Kilsheimer and KCE arent attempting to rescue people and buildings, they design major hotel office buildings, mostly in the Washington, D.C., area. With a client list that includes the Department of Defense, the FBI, and the Secret Service, its no wonder he was called on Sept. 11. Since then, KCE has been responsible for designing and overseeing the Phoenix Project, the official name for the rehabilitation of the Pentagon. Its a structure theyre familiar with, having worked with a basement addition that was built several years ago. We have made a commitment that we will have butts in chairs on nine eleven 2002 at 9:38 in the morning, he says.